MINNEAPOLIS — Devenir, a national leader in customized investment solutions for Health Savings Accounts (HSAs), released today the results of its 13th semi-annual HSA survey and resulting research report, which showed HSAs have grown to an estimated $37 billion in assets and 20 million accounts at year-end 2016 and have grown to over $41 billion in assets during the month of January. The survey data was collected between January and February of 2017 and primarily consisted of top 100 HSA providers in the health savings account market, with all data being collected for the December 31st, 2016 period as well as a January month-end update, since it is such a significant month for the industry. “We continue to see impressive growth in health savings accounts as accounts and assets continue the trend of nearly doubling every three years.” said Jon Robb, senior vice president of research and technology at Devenir. HSA accounts exceed 20 million. The number of HSA accounts rose to 20 million, holding almost $37 billion in assets, a year over year increase of 22% for HSA assets and 20% for accounts for the period of December 31st, 2015 to December 31st, 2016. Health plans remain as largest driver of growth. During 2016, health plan partnerships were the leading driver of new account growth for HSA providers, accounting for 37% of new accounts. HSA investments continue to grow. 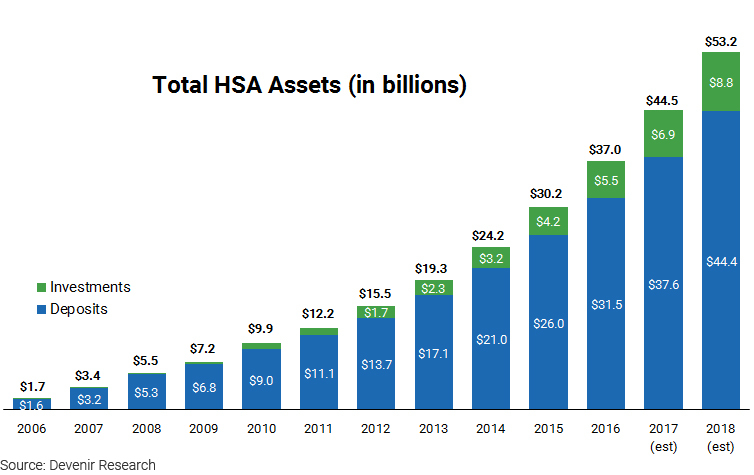 HSA investment assets reached an estimated $5.5 billion in December, up 29% year over year. The average investment account holder has a $14,971 average total balance (deposit and investment account). Devenir projects that by the end of 2018, the HSA market will likely exceed $50 billion in HSA assets covering over 27 million accounts. Projections derived from 2016 Year-End Devenir HSA survey, press releases, previous market research, and market growth rates. Projections are barring any regulatory or market environment changes. Forward-looking statements are based on current expectations and assumptions based on historical growth, the economy, other future conditions and forecasts of future events, circumstances and results.